You are here: Home / Campaigns / Veggie Tales Live Giveaway! Have you heard of Veggie Tales? If not, what rock have you been hiding under? Just kidding! Veggie Tales are a group of Vegetables that sing and dance and teach your children “Values to Live By.” We love Veggie Tales in our house. We went to go see a Veggie Tales Live show 2 years ago. The kids LOVED it. I can’t wait to surprise them with going to see it this year. The Veggies are at it again! Bob, Larry and the whole crew are taking to the stage with the silliest Silly Song Countdown ever! They have prepared the best of the best, the most classic of the classic, and the absolute silliest of the silly. But sometimes silliness just isn’t enough! Archie prefers lesson songs, Mr. Lunt wants to sing about food, and Jimmy and Jerry are stuck in the 80’s! Everyone wants their turn, and their songs in the show, but there’s only so much time! The entire VeggieTales crew will have to learn the importance of sharing to make this show work! A high-energy song and dance spectacular for the whole family, this show will have you singing along, dancing in the aisles and smiling so hard your teeth will ache! Fan favorites include classic silly songs such as His Cheeseburger, I Love My Lips, The Hairbrush Song, and so many more! 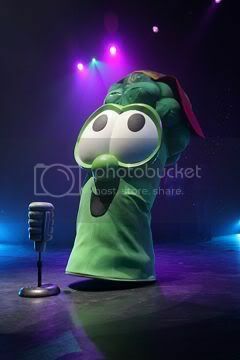 So join your favorite singing and dancing Veggies and SING YOURSELF SILLY! 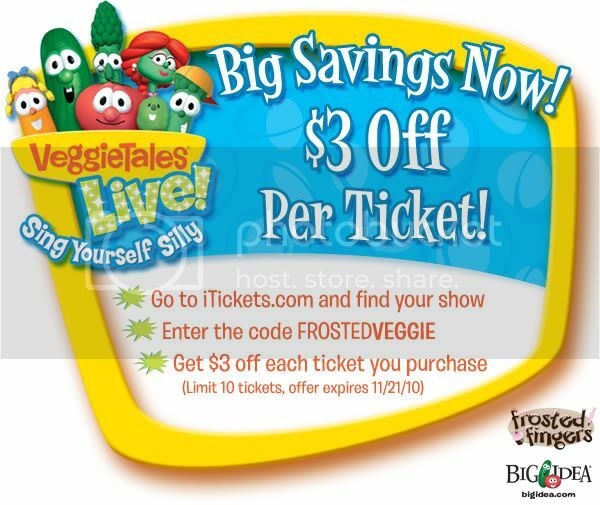 You can head on over to iTickets.com and purchase your own tickets for Veggie Tales Live. If you enter the code FROSTEDVEGGIE, you will get $3 off each ticket. Giveaway is open to US readers only. It will close 10/22/10. This post was written for Big Idea who provided my family with tickets in exchange for my honest opinion. Winner will be selected by the And The Winner Is plugin. Winner will be posted here on Frosted Fingers and notified by email. Winner will have 48 hours to claim the prize. We went to see VT Live in St. Louis and the show was FUNtastic! I know you will have a BLAST! I am partial to His Cheeseburger silly song. I like Veggie Tales on FB. I follow you on Twitter via Yellow Tennessee. My favorite silly song is “Oh, Where is my Hairbrush?” followed closely by “I love my Lips”. My favorite one to watch is the Jonah movie. My favorite silly song is Where Have All the Staplers Gone. Love it. My favorite show is … Uhm. So many, actually. I guess Minnesota Cuke and the Search for Samson’s Hairbrush. Love the Indiana Jones feel to it. It’s also one of the few I DON’T own on DVD. LOL. I netflix it. We like the adventures of Larry Boy!! Erin T. likes Veggie Tales on FB! Our family LOVES The Cheeseburger song and The Pirates Who Don’t Do Anything! We like to sing together as a family, taking turns being the different characters. Plus you’ll usually find us dancing along! Our favorite Veggie Tales movie is Pistachio, we rent it from Netflix all the time! Thanks so much for the chance, we love Veggie Tales!! My favorite silly song is Oh Where is My Hairbrush, since I don’t have any hair. A close second in the belly button song. They would be sooooo excited to win this!